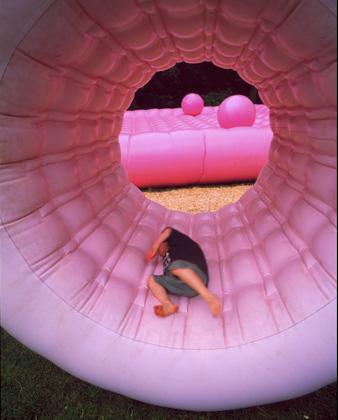 Twenty-four inflatable pink rubber objects and fifteen foam cubes were installed in a temporary playground beside a horse pasture in Wolfsburg, Germany, for the 2004 State Garden Show. The pink landscape created by the structures was designed to evoke childrens’ toys and contrast with the natural surroundings. There are no fixed uses for the objects in the Temporary Playground: they are both shelter and surface, capable of being rolled into any space, transforming a sidewalk corner or a vacant lot into a beguiling and playful garden. Topotek 1 is a Berlin landscape architecture firm founded in 1996 by Martin Rein-Cano; Lorenz Dexler joined the firm in 1999.